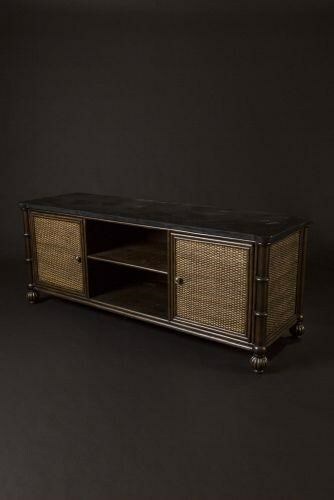 Capture the relaxed feel of tropical style with this TV console. The console features a mix of traditional shaping and tropical detailing for an elegant, yet distinctly tropical look. Woven cane panels exude rustic tropical style, while a sable finish on the hardwood frame fills your entertainment space with rich, sophisticated tones. Fluted bun feet and turned pilasters give the console its classic shape and a black mactan stone top further elevates the look. Open and concealed storage ensures easy access and storage space for your entertainment room essentials. The Kingston TV Console by C.S. Wo & Sons at C. S. Wo & Sons Hawaii in the Hawaii, Honolulu, Oahu, Hawaiian Islands, Waikiki, Diamond Head, East Honolulu area. Product availability may vary. Contact us for the most current availability on this product. Case Detail Fluted bun feet. Case Construction Hardwood, woven cane, and black mactan stone. The Kingston collection is a great option if you are looking for Traditional Tropical furniture in the Hawaii, Honolulu, Oahu, Hawaiian Islands, Waikiki, Diamond Head, East Honolulu area. Browse other items in the Kingston collection from C. S. Wo & Sons Hawaii in the Hawaii, Honolulu, Oahu, Hawaiian Islands, Waikiki, Diamond Head, East Honolulu area.